Bugun ve aksamki col sicaklarinda en iyi ne gider dedik ve kafa yormayan, sakin dingin bir film izleyelim dieyerek Hachi'yi sectik. Film bir kopek ve sahibi arasindaki bagi konu olan, gercek bir hikayeden alinan etkileyici bir film. Hatta kopegin heykeli bile dikilmis yani o derece! :) Kopek alasim geldi hemen film bitiminde:)) Hele hele de sizin kopeginiz varsa, hic durmayin hemen izleyin derim ben! A must see movie especially for those who have a dog! I do not have one and I said I wish I had a cute puppy! I would definitely get one if I had a backyard but I'm just not good at taking care of pets in my home. I also do not think that it's a right thing as I'm usually not home and I'd feel bad about it. I used to have a kitty, Daisy, but we had to give it away for the same reason. 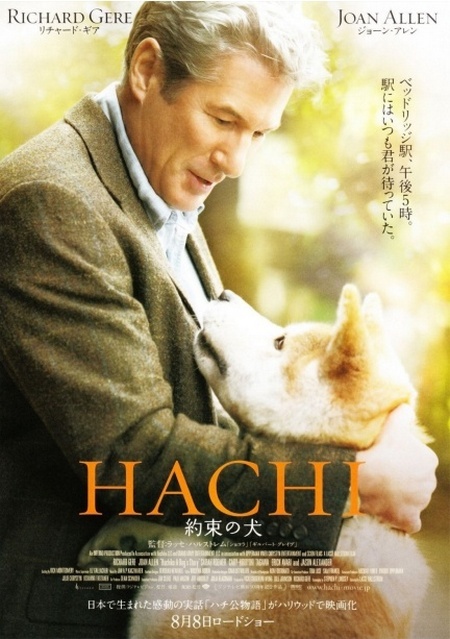 I'd definitely recommend that you watch this movie, it's very touchy and is based on a true story..
0 comments on "Hachi-A Dog's Tale"